The novel begins at some point in the past – the mid-1800s, sometime after the Gold Rush began in San Francisco. The book is actually a series of short stories, jumping back and forth between the past and future, showing the slow downfall of the human race. Various characters are willing to abuse, torture and mistreat their fellow humans in order to obtain what they desire, be that profit or power or control over others. Slavery is a topic that comes up several times, as well as the 20th century issue of a nuclear leak that poisons the Earth. Various thugs and gangs also play prominent roles. At some point in the progression of time, a cataclysmic event occurs which wipes out a large portion of the human race, and sends Earth into a post-apocalyptic downfall where the remaining humans are largely unaware of whether there are other surviving pockets of people. A return to religion occurs, centering around a Korean visionary who gains a mythical status, as humans try to regain a footing in a world that has essentially collapsed and returned to tribal forms of life and governing. But did I like it? The pros – some of the stories were deeply moving, with great character development that allowed the reader to step inside the story with the character and empathize with the circumstances. Other stories were bogged down with unwieldy language – Mitchell tried to grow the stories by having his characters speak dialects – complete with strange spellings of English words and made up words (think Vonnegut’s Cat’s Cradle). Although eventually you pick up the rhythm of this odd use of language, it prevented me from really bonding with the characters in those vignettes. And I found the tie ins to the other stories a bit weak. You could tell that Mitchell is making a point on the theme of humanity, interconnectedness, and cause and effect, but it fell flat. Finally, one day on the couch, on a Sunday afternoon, I was on the last twenty pages of the book. Jon was trolling around, eagerly waiting for me to finish. By this time the movie version had come and gone in theaters, and Jon had the newly released DVD in the DVD player ready to go. After the last page, I looked up and asked him a question about the ending (I don’t remember now what the question was). Jon said “Does that mean you are done?” I replied, “Yes,” and without another word, he pressed play on the DVD. This might be the only time in my life that I have ever liked a movie more than the book. The story in the movie intertwines the vignettes in the book with a series of flashbacks and flash-forwards that tie them together. Each actor plays multiple characters, leading the viewer to the conclusion of reincarnation, which although not implied in the novel, does help to reinforce the concept of the theme of humanity and interconnectedness. 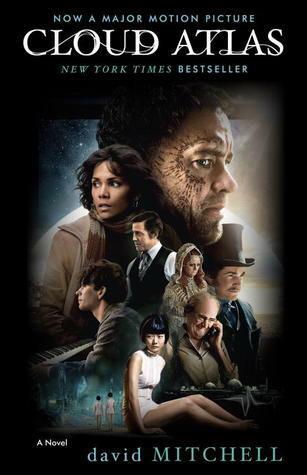 Not to mention a standout cast was led by Tom Hanks and Halle Berry. I was interested until the end. So, to sum up… Skip the book; watch the movie instead. On our full day in Portland, my cousin Megan wanted to spend the day doing some wine tasting in the Willamette Valley. My mom volunteered to be our designated driver, so we made plans to visit a couple of wineries and spend the day socializing and trying some new wines. Being from Michigan, Megan had never tried tried Oregon wines before, so she was looking forward to experiencing something new. To be honest though, I was a little concerned because Michigan wineries tend to make much sweeter wines than the wineries on the West Coast. I wasn’t sure if Megan would like them! After catching a bit of my nieces’ T-Ball game, we headed over to the Willamette Valley and made our first stop at Chehalem Winery. Chehalem is one of my absolute favorite wineries, and I was super-excited to be there because it was Best Barrel Day. Best Barrel Day is a special event that Chehalem puts on each year in May, the weekend before Memorial Day weekend. Jon and I are wine club members, one of the very few wine clubs that we belong to. The Best Barrels are available only to club members, and they are only available for tasting this particular weekend (they might taste them again the next weekend – Memorial Day – if there is still enough available). Megan and I began our tasting with the commercially released whites. We began with Inox Chardonnay, which is a wonderful crisp stainless steel aged Chardonnay. This is a fantastic white wine, that is consistent year to year and always a crowd pleaser when we have guests over. The Corral Creek Riesling is a great Willamette Valley Pinot Gris, with just enough sweetness. 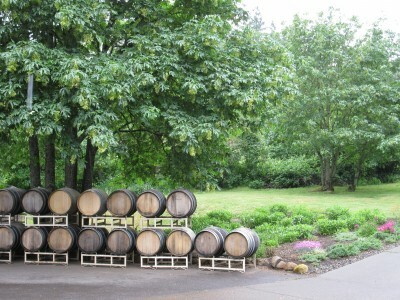 Chehalem Barrels – Waiting for Some Wine! 2012 Stoller Vineyards Chardonnay – this wine is aged on oak, so it is a bigger, bolder Chardonnay than the Inox, which is made from grapes from the same vineyard. It is wonderfully balanced between fruit and oak, with flavors of honey, pear and floral notes. 2012 Corral Creek Vineyards Pinot Noir – Corral Creek Vineyard is the Chehalem vineyard that produces the softest, most elegant Pinot Noirs. They are some of my favorites. This barrel is excellent, but this years Corral Creek grapes are more robust than typical, with a bit more earthy flavor than normal. It still has light tannins and the cranberry and cherry flavors that I enjoy so much. 2012 Stoller Vineyards Pinot Noir – This wine is very big, with a much darker purple color that a typical Pinot Noir. It is very spicy with much heavier tannins than many Pinots. This was my least favorite barrel of the bunch. That said, as the wine is not finished aging, I have every expectation that this wine will transform into a beautiful Pinot – Chehalem’s wines always do. 2012 Ridgecrest Vineyards Pinot Noir – This Ridgecrest Pinot Noir came from a block planted in 1983, and shows moderate tannins, some blackberry mixed into the cherry, and some light spice flavors (is it oregano or thyme?). This wine was my favorite from the five barrels. 2012 Wind Ridge Vineyards Pinot Noir – Wind Ridge is a smaller section within the Ridgecrest vineyard, and has characteristics that are similar to the Ridgecrest barrel. There are the same flavors of blackberry and spice, but a bit more pepper and earth than the Ridgecrest vineyard barrel. It was hard to choose the favorite between this one and the Ridgecrest, but this one came in a close second for me. It was always interesting to taste from the barrel – these young wines will change a lot before they are finally bottled and sold, but you can taste the beginnings of what they are going to become. After the barrel tasting, we headed back out to the event tent, where we got to taste the bottled versions of the Pinots that were recently released – 2011. The bottlings were the commercially released wines, so essentially, we were tasting the versions from all the barrels from the vineyards that were not selected as the best barrel. Even though these aren’t the Best Barrels, these wines are certainly nothing to turn your nose up at! The 2011 Corral Creek, Stoller, and Ridgecrest Vineyards Pinot Noirs are all excellent, and Megan and I enjoyed them immensely. They were served with some gourmet hors d’oeuvres, which paired nicely with the wines. Even though we don’t often have the opportunity to visit Chehalem, their events are always second to none. They make you feel welcome and valued when you visit, and I always have a great time. Still at the top of my list for wineries! Note: I apologize for the lack of photos on this post – I was enjoying myself so much that I neglected to take more pictures… I will try to do better next time. Detroit’s Bankruptcy Breaks an Art Lover’s Heart. I don’t normally post on current events. I decided when I started this blog that I didn’t want to provide commentary on the state of affairs of our country or our world. I wanted this blog to be cheerful and upbeat. But this news makes me sad. Detroit, Michigan has declared bankruptcy. What was once one of the grandest cities in the nation, if not the world, with its majestic art deco architecture and auto industry money. A city that has lately been much more known for its grand photo essays of urban decay. But a bright spot in all that blight has always been the Detroit Institute of Arts. If you live in one of the counties immediately surrounding Detroit, it is free to visit. We visited there in September, 2012 and I wish I could have spent days wandering its galleries – I blogged about my visit here. Quite simply put, this museum is amazing. And not just when you compare it to its surroundings. The DIA and its collections stand up as one of the finest art museums in the world. The museum is housed in a 1927 Beaux Arts building that is just as spectacular as the art it contains. The DIA received its first piece of art as a donation in 1883 and since that time, has grown to a collection of over 65,000 pieces. The DIA is the second largest municipally owned museum in the world. The art it contains is valued at an impressive $2.5 billion. The DIA has works by Picasso, Rembrandt, Van Gogh, Andy Warhol, Henri Matisse and numerous other painters. It contains priceless artifacts from Egypt, the New World, tribal art, religious artifacts, blown glass, and woodworking. There is a mural by Diego Rivera that spans all four walls of a huge room. There are pieces of antique furniture, vases, baskets and masks. The collections span the globe and all throughout human history. Unfortunately, with Detroit’s bankruptcy, creditors have begun to eye the DIA’s collections – you can read about it here. No one knows yet what will happen, but selling off the museum’s priceless works of arts to the highest bidder would be such a shame. There would be no way to know what would happen to the pieces; if they would end up in a private collection locked away from public view. Michigan’s Attorney General has issued a legal opinion arguing that the DIA’s art collection is held in a charitable trust for the people of Michigan, and therefore, the city of Detroit doesn’t own the art to sell it. I hope that legal opinion is upheld in the courts, if it comes to that. The DIA has been providing the public with access to art for over 130 years. I hope that it can continue. After my mom, my cousin and I visited the Tacoma Museum of Glass, we got back on the road and continued on our way to Portland. We weren’t sure if we would have enough time for our second destination – Fort Vancouver, a National Historic Site in Vancouver, Washington. The traffic gods were with us, and we made it there an hour before they closed! I had been there before, so I knew that an hour would be enough time to visit. When we got to the Fort, we stopped by the Visitor’s Center to check out the souvenirs (I had to get a few postcards!) and of course, we needed to get a stamp for my National Parks Passport! And then, we headed over to the site of the Fort. 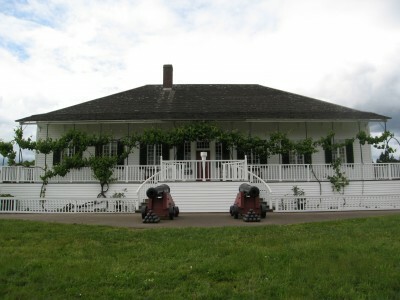 Fort Vancouver was founded during the winter of 1824-1825 by the Hudson’s Bay Company. If you are close to the Canadian border, like I am, you have probably heard the radio commercials for the Canadian department store, The Bay. Same company. The Hudson’s Bay Company began as a fur trading venture by England into Canada. In 1670. Yes, you read that correctly. The Hudson’s Bay Company is the oldest commercial corporation in North America, and one of the oldest businesses in the world! When the Hudson’s Bay Company began operations in North America, it served as the de facto government in the areas where it did business, and at one time, it was the largest landowner in the world. 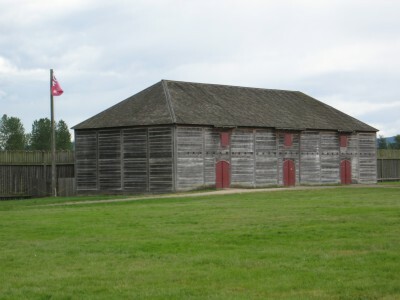 Fort Vancouver was set up to protect the interests of the Hudson’s Bay Company along the Columbia River and to serve as a hub for their fur trading operations in the West. The fort served as a collection point for the beaver hides that trappers in the West were bringing in. The site also offered fertile soil along the river, while lying just outside of the flood plain. The intention was for the fort to be self-sufficient, producing all of its own food and most other provisions, as goods were very expensive to ship. The fort was built with substantial palisades; the walls were 750 feet by 450 feet, and 20 feet high. Inside there were homes, and a school, library, chapel, pharmacy, blacksmith shop, warehouses and a manufacturing facility. Outside the wall were more homes, an orchard, gardens, a shipyard, distillery, tannery, sawmill and a dairy. 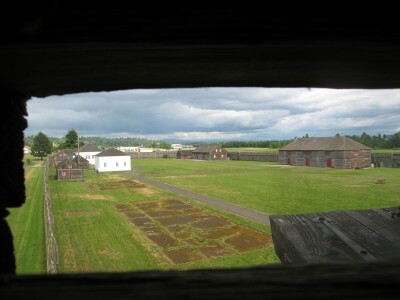 At its height, Fort Vancouver oversaw 34 outposts and about 600 employees. The beginning of the end of Fort Vancouver under the ownership of the Hudson’s Bay Company came in 1846. 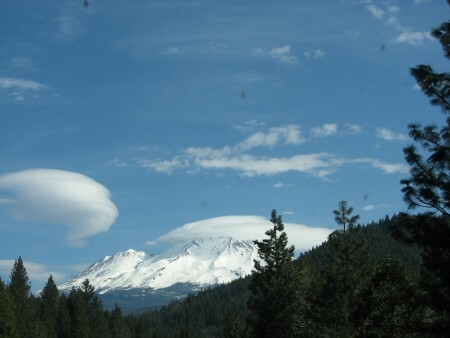 That year, the United States and Canada signed the Oregon Treaty, which set the border between the two companies at the 49th parallel – right up near my home! 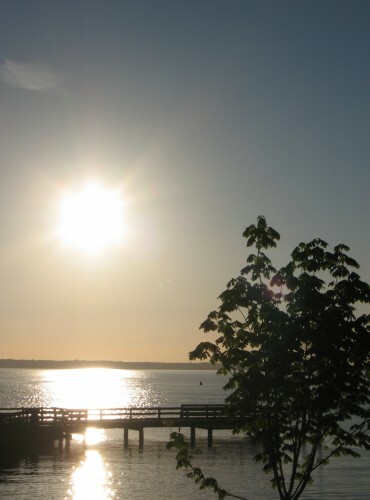 Although the treaty ensured that the Hudson’s Bay Company would be allowed to continue operations at Fort Vancouver, the treaty and the number of Americans moving into the area effectively stifled the fur trade there. At that point, beaver trapping had continued a such a high volume for so long that beavers were nearing the point of extinction. The Hudson’s Bay Company abandoned the fort in 1860 and moved north; the U.S. Army immediately took over the fort. 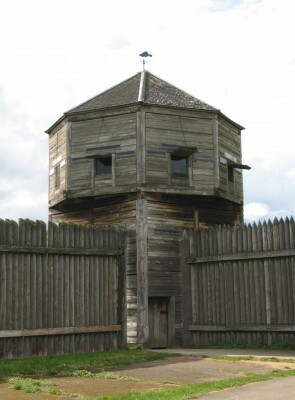 The Army had already had barracks right next to Fort Vancouver, but they built more barracks. During this era, the Indian Wars were happening in the West and Civil War heavies Ulysses S. Grant and Philip Sheridan were stationed there. The Vancouver Barracks continue to house troops through World War I and World War II, and even continued to serve as home to the Army Reserve and Washington National Guard until it finally closed as an active military installation in 2011. 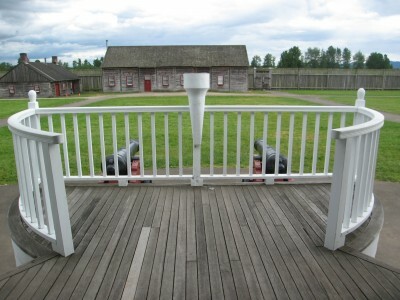 The buildings that are inside the fort now are reconstructions of the original buildings from the periodic of occupation by the Hudson’s Bay Company. Archeological digs at the site showed historians where the original buildings were and the size of the structures, so the reconstructions were built directly over the historical structures. We had the opportunity to wander around at our leisure – some of the buildings are open and you can go inside, but others are only open during special events. The friendly ranger explained that there are two other sites in Oregon City, Oregon, the Barclay House and the McLoughlin House, which were the homes of two employees of the Hudson Bay Company in their retirement. We didn’t have a chance to go there on this trip, but one day I’m going to make it over there to check them out too! I’m having an early dinner tonight, because in a couple of hours, I’ll be off to that timeless tradition, the high school reunion… I won’t tell you how many years it has been, except to say that it somewhere between 19 and 21. And for those of you who have seen photos of me on this blog and are puzzled by the math… I graduated high school when I was 3. I was a very precocious child. This week I have been reflecting on the fact that even though I still live in the same town where I grew up and went to high school, I hardly ever run into people that I went to high school with (I used to work with a childhood neighbor, but he has since sought greener pastures and changed jobs). Even though I work in HR, it had nothing to do with me – I swear! We live in the kind of small city that is blessed with abundant beauty, tons of recreational opportunities, great restaurants, low crime, and lots of small town charm. The inevitable tag alongs are screaming high real estate prices, lots of retired Californians, few jobs, and tons of college educated competition for those few jobs. OK, perhaps the Californians aren’t inevitable, but they are here. I was fortunate to find great jobs and a rare career progression here, when a lot of my peers weren’t so lucky. Moving away after high school or college to find employment somewhere else is the norm around here. So this weekend I will be reunited with my childhood peeps and I’m sure we will tell stories of life lived away from here and life lived here, and laugh about the crow’s feet, the gray hairs, the triumphs and the not-so-successful moments. Except I won’t have any stories about gray hair and crow’s feet, because I’m only 23. With my early dinner (because I’m certainly on the downhill slide to 5 o’clock dinners followed by BINGO, right? ), I decided to do a little pre-celebration with a glass of local wine. I’m drinking the 2008 Dolcetto by Dakota Creek. Dakota Creek was founded in 2005 by Ken and Jill Peck, who source most of their grapes from the Yakima Valley – many from the Rattlesnake Hills AVA. The Dolcetto has light tannins and aromas of ripe blackberries and prunes. It is smooth and fruit forward, with the same flavors following the nose. While not a terribly complex wine, it is a light red that won’t overpower anything you decide to pair it with. The winery is open Thursdays through Saturdays, and it is always a pleasant experience to sit out on their patio and enjoy your tasting while taking in the lush grass fields nearby. It doesn’t hurt that Ken and Jill are two of the friendliest people you will ever meet, and always the most gracious of hosts. Back in May (yes I realize I’m a bit behind in posting about all my adventures!) my cousin came out to visit from her home state of Michigan. She spent a few days with her brother in Oregon (I have spent years training my cousin and her family to not pronounce it Ore-Gone), and then hopped the Amtrak up to my neck of the woods. I took Friday off work and my mom, Megan and I went on a road trip down to Portland to visit my brother, my sis-in-law and my nieces and nephews. The plan was to take the whole day to make it to Portland, stopping at a few places along the way to do some sightseeing. I drive that long, boring road several times a year, and I was looking forward to an opportunity to do a bit of touristing in my own backyard. A few weeks before the visit, I emailed my cousin a list of the potential to-dos on the way down the I-5 corridor to Portland (what can I say – I like to have a plan). She picked some things that appealed to her and off we went. After an evening of drinking wine, laughing and staying up too late (it is the rare night when I stay up until midnight anymore! 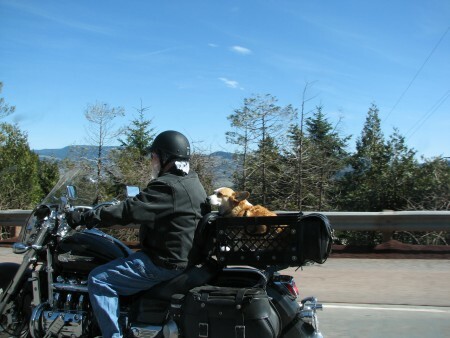 ), we dragged ourselves out of bed and got on the road. 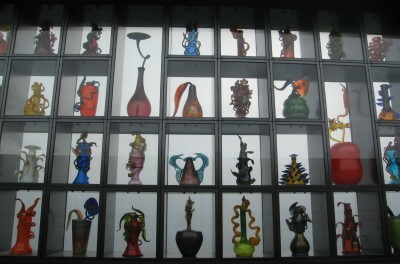 After a couple of hours on the road we were at the Tacoma Museum of Glass. I have been curious about it for a while, but hadn’t yet made it down for a visit. 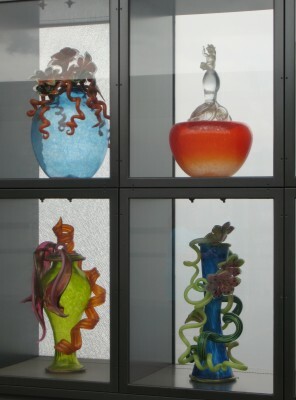 The Museum of Glass was the brainchild of Dr. Phillip Phibbs, the retired President of the University of Puget Sound. He contacted Dale Chihuly, a local glass artist who has gained worldwide acclaim for his huge indoor and outdoor glass installations, and a plan was hatched. About the same time, the City of Tacoma was working on a plan of urban renewal, and was looking for a project that could anchor a revamp of a waterway that had historically been part of a working waterfront. 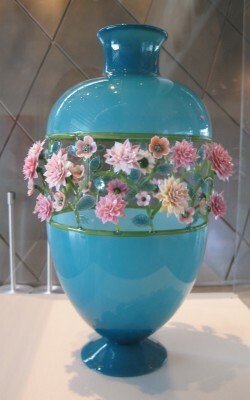 The Museum of Glass is a 75,000 square foot building with 13,000 of gallery space, and a 7,000 foot hot shop. The hot shop is a glass blowing demonstration area with seating for 145 people. There are several demonstrations each day and they are streamed live online. The museum also has a visiting artist program, where artists complete a residency of anywhere from a few days to several weeks. One piece from each artist’s residency goes into the permanent collection. We checked out the fountain in front of the museum and admired the beautiful glass pieces that make it so pretty. Created by Martin Blank, it consists of 754 individual pieces of glass! They are all clear glass pieces, and it made me wonder if maybe they have colored lights shining on them at night. Since we were only there during the day, we didn’t get to find out. After going inside the museum, we got some lunch at Choripan, an Argentine restaurant. I had the squash soup (very good – thick and creamy with just the right amount of spice) and the empanada. It has been a long time since I had an empanada, and these guys did a very good job. It was doughy and delicious. We checked out the hot shop, and caught the tail end of a glass blowing demonstration. Then we went inside the galleries. The pieces in the collection were all contemporary, and there were a wide variety of themes. Abstract figural glass, pots and bowls, landscape-type pieces to hang on the wall. 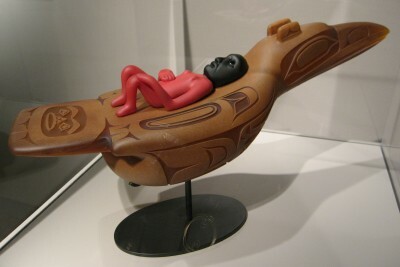 There were several Native American style pieces, and for lack of a better description, there were several still life style pieces, like what you might find in an office building or a restaurant display. The displays were neat, but I was a bit disappointed that there wasn’t any historic glass. It would have been nice to see how glass-making has changed over time. I know, I know, it is the history nerd in me! I also thought that the gallery space was a bit on the small side. 13,000 square feet in a 75,000 square foot building? What are they doing with all that extra space? The Hot Shop is only 7,000 square feet. 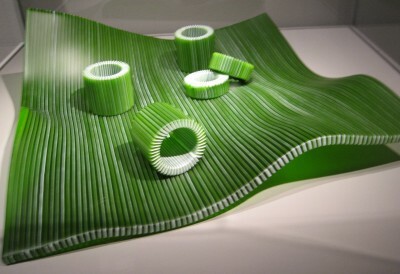 This Piece is Supposed to Evoke the Rolling Hills of Scotland and Bales of Hay – Do You See It? My Mom and I Did! After our time in the gallery, we saw the outdoor Bridge of Glass. The Bridge of Glass is a pedestrian walkway that goes over the freeway, connecting the waterway where the museum is located to the downtown Tacoma core. There are three main features of the bridge of glass. 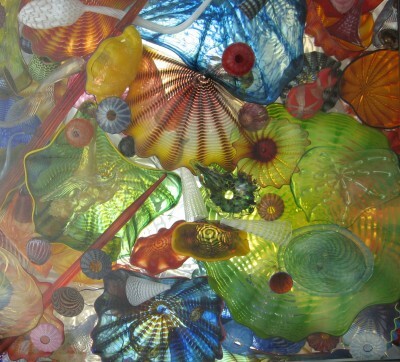 One section is a covered portion of the walkway, with 2,364 pieces of large Chihuly glass placed on a plate glass ceiling. You could spend hours looking up at the different pieces and always see something new! There is an installation called the Crystal Towers, which a two 40 foot tall polyurethane sculptures which are made to withstand the weather – and they glow at night! And, my favorite part of the bridge, the Venetian Wall, which consists of 109 blown glass Chihuly pieces that are set into a section of the walkway. They rise four levels high, and are extremely intricate and beautiful. Amazing! We spent a while trying to decide on our favorites, but it was really an impossible task! Closer View of the Venetian Wall – See That Detail! And with that, it was time to get back on the road and keeping heading towards our destination. Our visit to the Museum of Glass was very enjoyable – it doesn’t take more than a couple of hours to feel like you have seen all you need to see. And at $12 per adult, it isn’t overly expensive either. If you have a chance, it is certainly worth seeing!